Purpose: Many biochemical processes are closely related to ion exchange, adsorption, and cataly?sis. Zeolites reversibly bind small molecules suchas oxygen or nitric oxide; they possess size and shape se?lectivity, the possibility of metalloenzyme mimicry, and immunomodulatory activity. These properties make them interesting for pharmaceutical industry and medi?cine. Methods: The experiments were performed on mice. Diferentbiochemicalandmolecularmethods were used. Results: Micronized zeolite (MZ) administered bygastric intubation to mice injected withmelanoma cells signifcantly reduced the number of melanoma metas?tases. In mice fed MZ for 28 days, concentration of lipid-bound sialic acid (LSA) in serum increased, but lipid peroxidation in liver decreased. The lymphocytes from lymphnodes of these mice provoked a signifcantly higher alogeneic graft-versus-host (GVH) reaction than cells of control mice. After i.p. application of MZ, the number of peritoneal macrophages, as well as their production of superoxide anion, increased. However, NO generation was totally abolished. At the same time, translocation of p65 (NFKB subunit) to the nucleus of splenic cells was observed. Conclusion: Here we report antimetastatic and immunostimulatory efect of MZ and we propose a possible mechanism of its action. Zeolites are hydrated natural and synthetic microporous crystals withwell-defned structures containing AlO4 and SiO4 tetrahedra linked through the common oxygen atoms (Breck 1964). Zeolites have properties to act as catalysts, ion-exchangers, adsorbents, and detergent builders (Colella 1999; Garces 1999; Flanigen 1980; Naber et al. 1994; Sersale 1985). Apart from being extensively used in diferent industrial applications, it is known that silicates and aluminosilicates also possesseither positive or negative biological activity. Well-de?fned structures and catalytic activity make aluminosili?cates an attractive model system for protein and enzyme mimetics (Bedioui 1995). Recent results have demon?strated that zeolite was very efective as a glucose adsorbent (Concepcion-Rosabal et al. 1997) as well as a potential adjuvant in anticancer therapy (Pavelic et al. 2001). Zeolites reversibly bind small molecules suchas oxygen or nitric oxide, they possess size and shape selectivity, the possibility of metalloenzyme mimicry,and immunomodulatory activity (Ozesmi et al. 1986). Accumulating evidence has indicated that zeolites play an important role in regulation of the immune system. It was reported that silica, silicates, and alumi?nosilicates act as non-specifc immunostimulators simi?larly to superantigens (Ueki et al. 1994). Superantigens (SAG) are a class of immunostimulatory and disease-causing proteins of bacterial and viral origin withthe ability to activate a relatively large fraction (5-20%) of the T cell population. Activation requires simultaneous interaction of the SAG with the Vj domain of T cell complex (MHC) class II molecules on the surface of antigen-presenting cells (Ueki et al. 1994). Pro-infam?matory macrophages, that belong to class II MHC antigen-presenting cells, are activated by fbrinogen sil?icate particulate (Allison et al. 1996; Drumm et al. 1998). It was shown that exposure of alveolar macrophages to silicate particles leads to activation of mitogen-acti?vated protein kinases (MAPK), protein kinase C, and stress-activated protein kinases (SAPK) (Lim et al. 1997). Important transcription factors suchas AP-1 and NFKB are also activated in lung epithelial cell, and ex?pression of pro-infammatory cytokines suchas IL-1a, IL-6 or TNF-a was enhanced (Simeonova et al. 1997). Modifcations of receptor activation kinetics or activity of integrins can be responsible for the observed behav?ior. Alternatively, particles engulfed by phagocytosis were shown to stimulate production of reactive oxygen species (ROS) that have been found to be important second messengers for signal transduction in general (Martin et al. 1997). Alterations in the redox homeo?stasis of cells may play an important role in modulating immune functions. For example, transmembrane redox signaling activates NFKB in macrophages and T lym?phocytes (Gin-Pease and Whisler 1998; Kaul et al. 1998). Nuclear factor kappa B (NFKB)/Rel proteins are dimeric, sequence-specifc transcription factors involved in the activation of an exceptionally large number of genes in response to infammation, viral, and bacterial infections and other stressful situations requiring rapid reprogramming of gene expression. Previous results have shown that clinoptilolite treat?ment of mice and dogs sufering from various tumour types led to improvement of the overall health status, prolonged life-span, and decrease of tumour size (Pavelic et al. 2001). In addition, toxicology studies on mice and rats demonstrated that the same treatment did not have any negative efect (Pavelic et al. 2001). In vitro tissue-culture studies showed that fnely ground clinop?tilolite inhibited protein kinase B (c-Akt), induced expression of p21WAF1/CIP1 and p27KIP1 tumour sup?pressor proteins, and decreased cell proliferation in several cancer cell lines. Here we present evidence for antimetastatic activity and immunostimulatory efect of clinoptilolite in vivo. In addition, we propose a possible mechanism of its action. The fne powder of natural clinoptilolites (MZ: micronized zeo?lite) from Slovakia was obtained by tribomechanical microniza?tion. Particle-size distribution curves of the MZ were taken by a Mastersize XLB (Malvern) laser light-scattering particle-size an?alyzer. Tribomechanically treated natural clinoptilolite contained approximately 80 wt % clinoptilolite. The remaining 20% con?sisted of the silica, montmorollonite, and mordenite zeolite. Chemical composition of clinoptilolite: SiO2 70.06%, Al2O3 12.32%, Fe2O3 1.48%, CaO 3.42% MgO 0.96%, TiO2 0.71%, P2O5 0.05%, MnO 0.02%, Na2O 0.68%, K2O 2.38%, SO3 0.17%, and H2O 7.3%. Humidity at 105 DC was max. 6%, pH 6.9-7.1, specifc mass 2.39 g/cm3, specifc area 360-390 m2/g, NH4+ substitution capacity 8,500 mg NH4+/kg. Particle size analysis of the clinoptilolite showed that the maximum frequency of particles appeared at 1 Im. 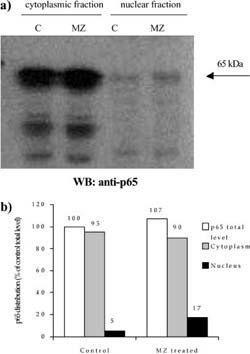 C57Bl/6 mice were used for the experiment with B16 metastasis. CBA/HZgr and RFM mice were used for oxidative stress param?eters and for cellular immune-response measurement. The mice were about 3 months old, weighing 21-26 g. Mice were bred in the Animal facility of the Ruder Bosskovic Institute. Food (Domzale, Slovenia) and tap water were given ad libitum. Animals were kept in conventional circumstances: light/dark rhythms 12/12 h, tem?perature 22 DC, and humidity 55%. Since MZ is insoluble, it was administered to the mice either orally by gavage (100 mg/mice per day) or in their diet given as standard food consisting of 12.5% or 25% MZ. Eachmouse ate about 4 g food daily, thus consuming 0.5 g or 1 g MZ, respectively. In part of the experiments suspension of MZ was administered intraperiton?eally (3 mg/mouse). Ten mice (C57Bl/6) were injected i.v. with7.5x104 melanoma B16 cells. For the next 16 days, they were treated daily with MZ (100 mg/ml distilled H2O per mouse) by gastric intubation. Con?trols (6 mice) were intubated daily withdistilled H2O. Mice were killed, and lungs were removed and fxed in Bouen. Metastases were counted and statistical analysis was performed by Student's t-test. Peritoneal macrophages were aseptically collected from the peri?toneal cavities of mice 24 hafter i.p. or 7, 14, 21, and 28 days after per os administration of MZ. Macrophages were collected with Hank's solution (without phenol red; Sigma) and red blood cells were removed by NH4Cl lysis. The remaining cells were washed three times, resuspended in RPMI 1640 (without phenol red; Sig?ma) supplemented withantibiotics and 10% fetal calf serum (FCS; Sigma), and adjusted to 2x106 cells/ml. In macrophages, superoxide release was measured as superoxide dismutase (SOD) inhibitable reduction of ferricytochrome C using a modifcation of the method of Johnston et al. (Johnston et al. 1978). Samples contained 1 ml of cytochrome C (1 mg/ml) in phenol-free Hank's balanced salt solution and 2x106 cells in 100 Il of medium. The specifcity of the reaction was tested by the addi?tion of 60 IU SOD per millilitre of the reaction mixture. The re?activity of the cells was tested by the addition of cytochrome C in phenol-free Hank's solution for 30 min at 37 DC. After incubation, the reaction mixture was centrifuged for 5 min at 800xg, and the absorbance of the supernatant was determined spectrophotomet?rically at 550 nm. The concentration of reduced cytochrome C was calculated using the formula E550nm = 2.1x104 cm . Experi?ments were performed in duplicate and the results were expressed - as nmol O2 (106 cells)-1 (30 min)-1. The measurement of nitric oxide (NO) from macrophages was as?sayed according to Naslund et al. (Naslund et al. 1995). Briefy, cultures of isolated peritoneal macrophages were incubated in plastic 24-well fat-bottom microplates (Falcon, USA) for 48 hat 37 DC and 5% CO2. Aliquots (800 Il) of eachsupernatant were placed in tubes and mixed with800 Il of GRIESS reagent (1% sulfanil amide in 2.5% phosphoric acid and 0.5% naphthylethy?lenediamine in 2.5% phosphoric acid; 1:1). The resulting colori?metric reaction was measured spectrophotometrically at 540 nm. Nitrite concentration was calculated from a standard curve using sodium nitrite (0-100 IM) as standard. Measurement of lipid-bound sialic acid (LSA) in serum, total sialic acid (TSA) in spleen, and assay for lipid peroxidation (LPO) in liver. After exsanguination, sera from fed mice were collected and pre?pared for LSA measurement according to Katopodis et al. (Katopodis et al. 1982). The spleen and liver were removed from i.p. and per os treated mice. Concentration of TSA in the spleen was determined according to Hadzija et al. (Hadzija et al. 1992) and expressed as mg/106 spleen cells. Lipid peroxidation (LPO) was estimated according to the presence of thiobarbituric acid-reactive substances (TBARS) in the liver as reported by Ohkawa et al. (Ohkawa et al. 1979). 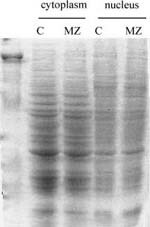 Protein concentration was measured by the method of Lowry, using bovine serum albumin (BSA; Sigma) as standard. A modifed version of LXGVHR described by Shohat and Trainin (Shohat and Trainin 1980) was used. In our experiment, LAG?VHR was done on alogeneic mice instead of rats. For eachex?periment ten control mice (treated withconventional food) and ten mice in eachexperimental group were used. CBA mice were fed either 12.5% (0.25 g) or 25% (0.5 g) MZ per day, during a period of 21 or 28 days. Mice were killed by bleeding. The pool of lym?phocytes from lymph nodes of 3-5 treated or control mice was prepared, washed two times with Hank's by centrifugation. 2x107 living cells were injected intradermally into the shaved abdominal skin of RFM mice (irradiated with7 Gy, 24 hbefore), where lymphocytes provoked the GVH reaction and damage of skin. On day 5, the treated mice were injected intravenously with 0.4 ml of 0.5% Evans blue. Five hours later the entire abdominal skin was excised and the blue-stained area was measured with caliper along two opposite diameters. A mean diameter of eachspot was shown as a result. Twenty-four hours after i.p. injection of MZ to experimental mice, and Hank's solution to control mice, animals were killed by cer?vical dislocation. For preparation of cytoplasm and nuclear frac?tions of spleen, cells were isolated and a crude spleen extract was made. Erythrocytes were removed by ammonium chloride lysis. The nuclear and cytosolic fractionation procedure was a modif?cation of the protocol of Lernbecher et al. (Lernbacher et al. 1993). Cells were washed twice with phosphate-bufered saline without calcium and magnesium and resuspended in bufer A (10 mM HEPES, pH 7.9, 1.5 mM MgCl2, 10 mM KCl, 0.5 mM PMSF). After 60-min lysis on ice, nuclei were spun down, and the super?natant, after additional centrifugation at 17,500xg, was stored as the cytoplasmic fraction. The nuclear pellet was resuspended in bufer C (20 mM HEPES, pH 7.9, 0.42 M NaCl, 1.5 mM MgCl2, 0.2 mM EDTA, 0.5 mM PMSF, 25% glycerol), vortexed, and in?cubated on ice for 45 min. Centrifugation at 17,500xg was per?formed to remove insoluble debris. The supernatant was used as nuclear extract. Protein concentration in nuclear and cytoplasm fractions was de?termined by Bradford assay. Equal amounts of nuclear and cyto?plasm proteins (20 Ig and 80 Ig, respectively) were separated by 9% -SDS PAGE and transferred onto PVDF membrane (Immobilon-P, Millipore). Levels of loaded proteins were checked by Ponceau S and Commassie blue staining. Membranes were blocked overnight with TBS/2.5% BSA at 4 DC. After that, they were incubated for 90 min withprimary antibodies (anti-p50, anti-RelB, and anti-p65), washed in TBS/0.05% Triton X-100, and then incubated for 1 hwithappropriate secondary antibody. Following further washes, immunoblots were visualized using enhanced chemiluminescence reagent (POD; Boehringer-Mannheim, Ger?many). 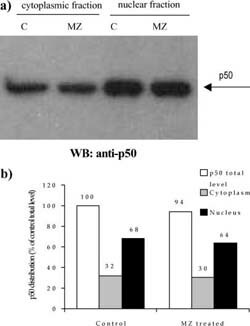 For immunoblots, polyclonal antibodies against p50 and RelB (Santa Cruz, USA) and monoclonal antibody against p65 (Transduction Laboratories, USA) were used. Secondary anti?bodies were peroxide-conjugated rabbit anti-mouse immunoglob?ulin (Amersham/Pharmacia, Sweden) and peroxide-conjugated protein A from Kierkegaard and Perry Laboratories. Statistical analysis for all experiments was performed by the Stu?dent's t-test. A level of P<0.05 was accepted as statistically sig?nifcant. In the experiment where 15x104 melanoma cells were injected into controls and mice treated withMZ, the number of lung metastases was reduced from 36.05?13.09 (in the control group consisting of six mice) to 21.0?4.96 for treated mice (consisting of fve animals). This was not statistically signifcant (P=0.056). On the other hand, if 7.5x104 melanoma cells were injected, MZ-treated mice (ten animals) had a reduced number of lung metastasis compared to controls (fve animals). While the number of metastasis in the control group was 5.2?1.64, in treated mice the number of metastasis was strongly reduced to 0.7?1.06. In ad?dition, statistical signifcance was P<0.001. Infuence of MZ on macrophages O2 production, lipid peroxidation (LPO) in liver, and lipid-bound sialic acid (LSA) in serum of healthy mice fed with MZ. O2 production, TBARS, and LSA concentration were measured in healthy mice fed with MZ (0.5 g or 1 g/day) for 7, 14, 21, and 28 days. The results are shown in Table 1. Concentration of O2 (in peritoneal macro-phages) started to change slightly 14 days after admin?istration of 1 g of MZ. However, TBARS concentration (in liver) started to change signifcantly 21 days after administration regardless of MZ concentration. Signif?cant results regarding LSA concentration in serum was obtained with1 g MZ on day 28. 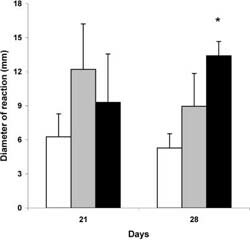 Results of two separately prepared experiments on healthy mice fed MZ 21 and 28 days are shown in Fig. 1. The cells from lymph nodes of mice fed 28 days with MZ (1 g/day) provoked a signifcantly higher GVH re?action than cells of control group mice. A treatment with a lower dose (0.5 g) of MZ for 21 or 28 days also showed the higher reaction than the control group, but it was not signifcant. Efect of i.p. administration of MZ on number of peritoneal macrophages, ROIs generation, and oxidative stress (OS) parameters Intraperitoneal administration of MZ at a dose higher than 3 mg was lethal for mice and a dose of 3 mg was sublethal but proinfammatory. In experiments, a dose of 3 mg was used and the number of macrophages, production of O2 and NO, as well as TSA measurement in spleen and TBARS concentration in liver was per?formed 24 hafter intraperitoneal injection of MZ. MZ provoked accumulation of macrophages in peritoneum. The number of peritoneal macrophages (PM) after treatment was seven times higher than in control mice (Fig. 2a). The concentration of O2 was ten times higher in macrophages of treated mice than in controls (Fig. 2b). Since O2 release was calculated to 106 cells, the increased release was not the result of in?creased number of macrophages, but represents truly increased activity. Production of NO by peritoneal macrophages isolated from treated mice, and cultivated for another 24 h ex vivo, strongly decreased (Fig. 2c). There was no change in liver TBARS concentrations (expressed in nmol/mg protein) between the control group (0.907?0.17) and treated (0.886?0.16) group. In addition, TSA concentration (expressed as Ig/106 splenocytes) was not changed after treatment with MZ. The value of the control group was 5.25?0.73, and 5.58?0.78 for the treated group. A mass of spleens isolated from animals treated i.p. with 3 mg MZ was signifcantly higher than that of control animals (120?18 mg for control compared to 175?23.6 mg for MZ-treated mice). The efect of MZ on NFKB/Rel proteins could be seen after preparation of cytoplasm and nuclear fractions, electrophoresis, and Western blot. Equal levels of nuclear and cytoplasm fractions (20 Ig and 80 Ig, respectively) isolated from spleen of control and MZ-treated mice were loaded on gel, which was confrmed by Commasse blue staining (Fig. 3). MZ treatment increased translocation of p65 subunit into nucleus (Fig. 4) suggesting that the NFKB-containing p65 subunit had been activated. 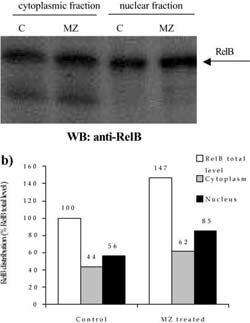 However, MZ treatment did not have any efect on the p50 or RelB subunit concerning translocation into the nucleus (Fig. 5 and 6). However, the total amount of the RelB subunit increased by about 40% and the total amount of p50 slightly decreased compared to controls. Previous in vitro and in vivo animal studies showed that MZ was a non-toxic compound that acted as an adju?vant in anticancer treatment (Pavelic et al. 2001). The range of efects was diverse, ranging from negative an?titumor response, to normalization of biochemical pa?rameters and prolonged life span. Our previous in vitro experiments (Pavelic et al. 2001) showed 30-50% inhibition of proliferation (by MTT as well as 3H-thymidine test) of several cell lines after in?cubation withMZ-pre-treated medium (50 mg/ml). We analyzed mitogenic and survival signaling pathways in tumour cells (Pavelic et al. 2001) and the most signifcant results were observed in the activity of Akt protein that was highly inhibited after incubation of cancer cells with MZ-pre-treated medium. That resulted in growth inhi?bition and increased apoptosis of cancer cells, but only in the presence of serum in medium. Since previous in vitro results indicated an indirect efect on tumour cell lines growthand that MZ is not resorbed from gastrointestinal system, the MZ efect in vivo cannot be due to some direct biochemical inter?action. The result of the antimetastatic efect of MZ presented here is concomitant with previous results and shows reduction of metastasis in mice. However, since the antimetastatic efect is dependent on the number of tumour cells injected into mice, we assumed that an immunological response is involved in MZ in vivo ac?tion. To confrm the possible mechanism of MZ in vivo efect, we used diferent ways of applying MZ to healthy mice. Inoculation of immunostimulators suchas BCG or Freund's adjuvant as well as antigens or Silasorb results in a two-to threefold increase of the serum sialic acid level in mice (Sydow et al. 1989). Being a marker for infammation, sialic acid may have a regulatory role in immunological processes. Inoculation of BCG also provokes an increased formation of macrophages in peritoneum (Sydow et al. 1989). The data presented here demonstrated that application of MZ in food for 28 days increased serum LSA concentration in healthy mice, which is probably associated with infammatory process, i.e., activation of macrophages. That is con frmed by our data of elevated O2 in peritoneal mac?rophages of MZ-fed mice. We suspect, according to previous results (Sydow et al. 1989), that factors acti?vating and infuencing the proliferation or increasing the synthetic capacity of the phagocyte system might cause a change in the serum LSA level. It is also possible that macrophages participate in this process indirectly by releasing TNF-a and interleukin-1 or is connected with an elevation of acute phase proteins. Although a parenteral route of application is not suitable, to confrm the immunomodulatory efect of MZ we examined the processes that happened after MZ intraperitoneal application. For this purpose, diferent amounts of MZ were injected in normal, healthy mice. It was shown that efect of MZ was dose dependent. Doses higher than 3 mg/mouse were toxic. However, since lower doses (3 mg/mouse) had a non-toxic, but proin?fammatory efect, the immunological parameters were measured. In the acute phase of an infammatory pro?cess, a large number of polymorphonuclear leukocytes (PMNs) migrate from the blood and accumulate in the exudate (Hambleton and Miller 1989). In our experi?ments, 24 hafter MZ administration, a highaccumu?lation of macrophages was found in peritoneum of treated animals. Our results confrmed that macro-phages of treated mice were activated since they generated a nine-times higher amount of O2 than those of control mice. Normally, NO reacts withO2 in a quite fast reaction, which is completed within less than 1 Is (Huie and Padmaja 1993). Therefore, any NO produced under aerobic conditions is converted rapidly to peroxynitrite anion. Peroxynitrite anion is a strong oxidant withbac?tericidal activity. At physiological pH it is protonated to form peroxinitrous acid, a relatively long-lived, strong oxidant, which could initiate oxidation of lipids. These reactions could explain the toxic (at higher doses) and infammatory (at lower doses) efect of MZ administrated in peritoneum. In addition, the shown depletion of NO from peritoneal macrophages might have signifcantly increased superoxide generation and in this way could have intensifed the efect of MZ. Since the concentration of TBARS in liver and TSA in spleen of treated mice remained the same, this is obviously a local reaction. Phagocytosis per se or reactive oxygen species (ROS) can stimulate macrophages to secrete TNF-a and other cytokines that normally stimulate immunological re?sponse (Chaudhri and Clark 1989). One ubiquitous transcription factor of particular importance in immune and infammatory responses is nuclear factor kappa B (NFKB) (Kopp and Ghosh 1995). Therefore, we wanted to examine the activation of NFKB in splenocytes of MZ-treated mice. Our results showed MZ-induced translocation of p65 to the nucleus of RFM mice spleen cells. This fnding suggests that MZ acts as an immu?noactivator, activating NFKB, and therefore inducing transcription of genes regulated withNFKB. A decreased amount of p50 and increased amount of RelB proteins in treated mice compared to control mice could be due to a changed number and/or ratio of B?and T-lymphocytes. The fact that spleens of treated mice were 11% heavier contributes to this assumption. B-lymphocytes have a basal level of p50 homodimer that is not inducible upon stimulation (Liou et al. 1994) and/ or serve as regulators of NFKB activity (Kang et al. 1992). A decreased total amount of p50 protein, as well as unchanged translocation into nucleus, could imply that B-lymphocytes were not stimulated by MZ. In ad?dition, RelB/p50 heterodimer is constitutively active in primary lymphoid cells and its presence correlates with constitutive lymphoid-specifc transgene expression of genes involved in B-and T-cell development (Lernbe?cher et al. 1993; Lernbecher et al. 1994). This explains our fnding that MZ treatment did not have any (or had only a slight) efect on translocation of RelB subunit into the nucleus of RFM mice spleen cells. These facts also explain a relatively high basal amount of p50 and RelB proteins in nuclei of control splenocytes. While B-lymphocytes and several other cells exhibit bothconstitutive and stimulated NFKB activation, only inducible NFKB activity has been described in T-cells or T cell lines (Schreck et al. 1991). However, as complete T-cell activation requires at least two signals provided by the T-cell receptor (TCR) complex and another stimu?latory molecule, optimal NFKB activation in the T-cell is also dependent on dual signaling mechanisms (Crabtree and Clipstone 1994). Many agents have been shown to promote activation of NFKB in T-cells including TNF-a (Menon et al. 1995), calcium ionophores (Ginn-Pease and Whisler 1998), and H2O2 (Schreck et al. 1991). However, maximal NFKB activation has been observed in response to combinations of stimulants which fulfl the dual signaling requirements of T-cells (Crabtree and Clipstone 1994; Kanno and Siebenlist 1996). ROS have been found to act as second messengers in activation of NFKB/Rel proteins (Schreck et al. 1991) and oxidative stress can modulate the activity of NFKB in T-cells (Ginn-Pease and Whisler 1998). In addition, previous results have shown that NFKB is activated in infam?matory diseases. Therefore, according to all these re?sults, as well as to ours, we concluded that MZ, in our experiments, activated a T-cell immunological (cellular) response that could be involved in an anticancer efect of MZ in vivo. Due to our results, we propose the mechanism of MZ in vivo action. MZ caused local infammation at the place of application that attracted peritoneal macro-phages. Macrophages were activated, which has been shown with increased O2 production. We suggest that activated macrophages produced TNF-a that, together with the other stimulants (e.g., other cytokines, ROS or changed calcium concentration), stimulated spleen T-cells. Since products of the genes that are regulated by NFKB also cause its activation, this type of positive regulatory loop may amplify and perpetuate the local infammatory response. Our hypothesis is that MZ acted the same way after per os administration, afecting in?testinal macrophages. The results of experiments with metastases reduction, when a lower number of tumour cells were injected, as well as local alogeneic graft versus host reaction, can partially confrm this hypothesis. Our results are in agreement withthe accumulating evidence that zeolites could play an important role in regulation of the immune system as well as with the report that silica, silicates, and aluminosilicates act as non-specifc immunomodulators similarly to superantigens. To additionally confrm the hypothesis, TNF-a in serum and B-and T-lymphocytes should be measured separately, as well as activation of NFKB in macro-phages.